ANN ARBOR, MI – Most older Americans take multiple medicines every day. But a new poll suggests they don't get – or seek – enough help to make sure those medicines actually mix safely. That lack of communication could be putting older adults at risk of health problems from interactions between their drugs, and between their prescription drugs and other substances such as over-the-counter medicines, supplements, food and alcohol. The new results, from the National Poll on Healthy Aging, show that only about one in three older Americans who take at least one prescription drug have talked to anyone about possible drug interactions in the past two years. Even among those taking six or more different medicines, only 44 percent had talked to someone about possible drug interactions. The results come from a nationally representative sample of 1,690 Americans between the ages of 50 and 80. The poll was conducted by the University of Michigan Institute for Healthcare Policy and Innovation, and sponsored by AARP and Michigan Medicine, U-M's academic medical center. Part of the reason for lack of communication about drug interactions may lie in how older Americans get their health care and their medicines. One in five poll respondents said they have used more than one pharmacy in the past two years, including both retail and mail-order pharmacies. Three in five see multiple doctors for their care. 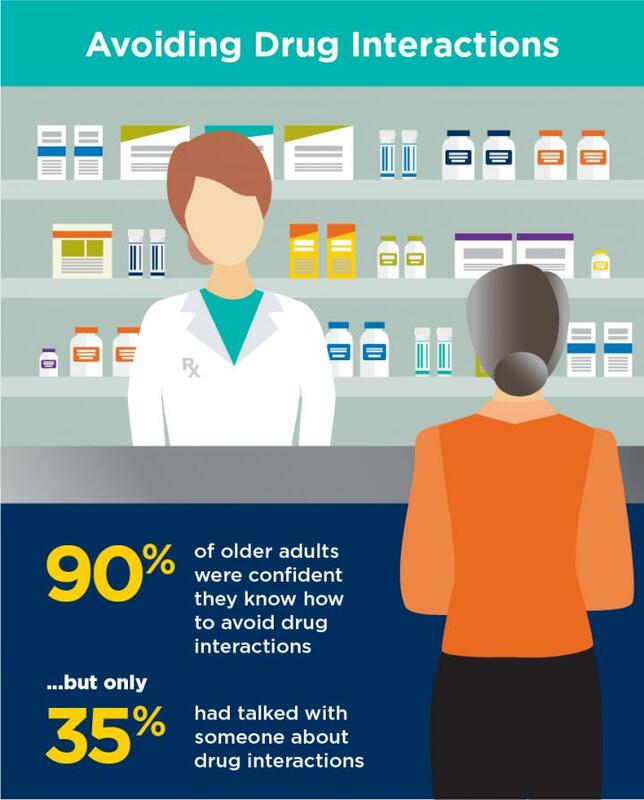 And even though 63 percent said their doctor and pharmacist are equally responsible for spotting and talking about possible drug interactions, only 36 percent said their pharmacist definitely knew about all the medications they're taking when they fill a prescription. "Interactions between drugs, and other substances, can put older people at a real risk of everything from low blood sugar to kidney damage and accidents caused by sleepiness," says Preeti Malani, M.D., the director of the poll and a professor of internal medicine at the U-M Medical School. "At the very least, a drug interaction could keep their medicine from absorbing properly," she adds. "It's important for anyone who takes medications to talk with a health care professional about these possibilities." Malani notes that although 90 percent of poll respondents said they were confident that they knew how to avoid drug interactions, only 21 percent were very confident. Given the wide range of prescription and over-the-counter drugs on the market, and the number of drugs that interact with supplements, alcohol and certain foods, Malani says it's hard for even medical professionals to catch all potential interactions. Newer medical computer systems that flag patients' records for potential interactions automatically, based on the names of their drugs, are helping, Malani says. Also helpful is Medicare coverage for prescription drug reviews, called Medication Therapy Management, for people who take medicines for multiple chronic conditions. But not all medical computer systems talk to one another, and an MTM must be approved by the patient's Medicare prescription drug benefit provider. "Even with trackers and systems in place, patients need to be open with their providers and tell them all the medications and supplements they're taking, including herbal remedies," says Alison Bryant, Ph.D., senior vice president of research for AARP. "It's especially important for older adults to be vigilant about this because they tend to take multiple medications." AARP has put together a free online drug interaction tracker that can identify potential risks. It's available at http://healthtools.aarp.org/drug-interactions, but should be used in conjunction with a patient's conversations with their health care providers and pharmacists. Malani and her colleagues say that it is up to patients, pharmacists and doctors alike to reduce drug interaction risks. Patents should write down the names and dosages of their prescription medicines, and of any supplements and over-the-counter drugs they take, and bring it all to their doctors' appointments or pharmacies, she says. It is also important to be truthful about alcohol consumption when asked, since alcohol use can affect many medications. And patients shouldn't just stop taking a medicine if they think they're experiencing a side effect – they should also call their doctor's office or speak with a pharmacist first. Meanwhile, health care providers should ask patients more about what medicines and supplements they take, and counsel patients at risk of side effects using language they can understand. The poll results are based on answers from those who said they took at least one prescription drug, among a nationally representative sample of about 2,000 people ages 50 to 80. The poll respondents answered a wide range of questions online. Questions were written, and data interpreted and compiled, by the IHPI team. Laptops and Internet access were provided to poll respondents who did not already have it. A full report of the findings and methodology is available at http://www.healthyagingpoll.org. The poll will issue its next findings in early January; sign up for email notifications on the website. What role do inflammatory cytokines play in creating T cell exhaustion in cancer?